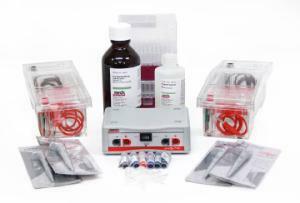 These bundles are everything you need to perform agarose gel electrophoresis. Gel electrophoresis is a great way to introduce your students to biotechnology and reinforce key genetics concepts. 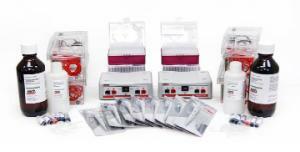 These convenient bundles are designed to provide you with all of the materials you need to perform gel electrophoresis with your students. Choose the size of equipment bundle that you need based on your class size. Our basic systems offer an affordable solution with easy-to-use electrophoretic dyes. Ordering information: Small Basic Bundle contains 2 gel boxes; 1 power supply; 4 fixed-volume (10μL) micropipettes; 2 racks of tips; 1 kit: "Introduction to Gel Electrophoresis with Dyes. 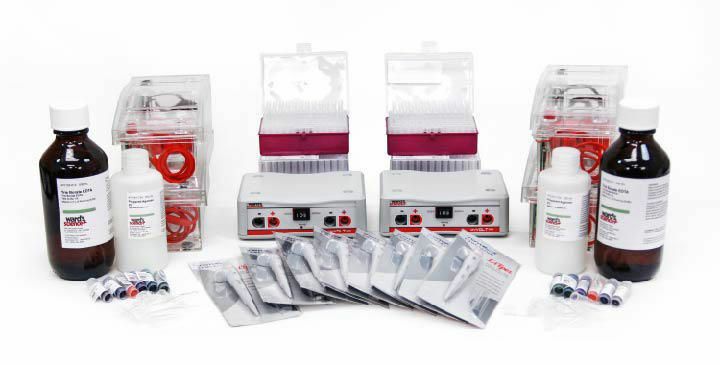 Medium Basic Bundle contains 4 gel boxes; 2 power supplies; 8 fixed-volume (10μL) micropipettes; 4 racks of tips; 2 kits: "Introduction to Gel Electrophoresis with Dyes. Large Basic Bundle contains 6 gel boxes; 3 power supplies; 12 fixed-volume (10μL) micropipettes; 10 racks of tips; 3 kits: "Introduction to Gel Electrophoresis with Dyes.